TIP: We like to use Kinnikinnick Soft Hamburger Buns for this. Geoff slices off the crusts on the top and bottom, turning them into a kind of round, thick bread slice. Butter the outsides of your bun/bread. Place one slice, butter side down, on the grill of your preheated panini press. TIP: If you don’t have a panini press, you can grill the sandwich in the oven or in a frying pan, or you can try the double pan method as shown here. TIP: If you are making both gf and non-gf sandwiches make sure you make the gf sandwiches first and line the top and bottom of the press with parchment paper to avoid cross contamination. If you are considering buying a press, I recommend one where the grills can be removed and washed in the dishwasher. Layer with 1 slice of havarti. Cover the havarti with turkey and layer again with the final slice of havarti. Place the second slice of bread on the top, butter side out. Close your panini press and cook until the bread is toasted and the cheese melted. 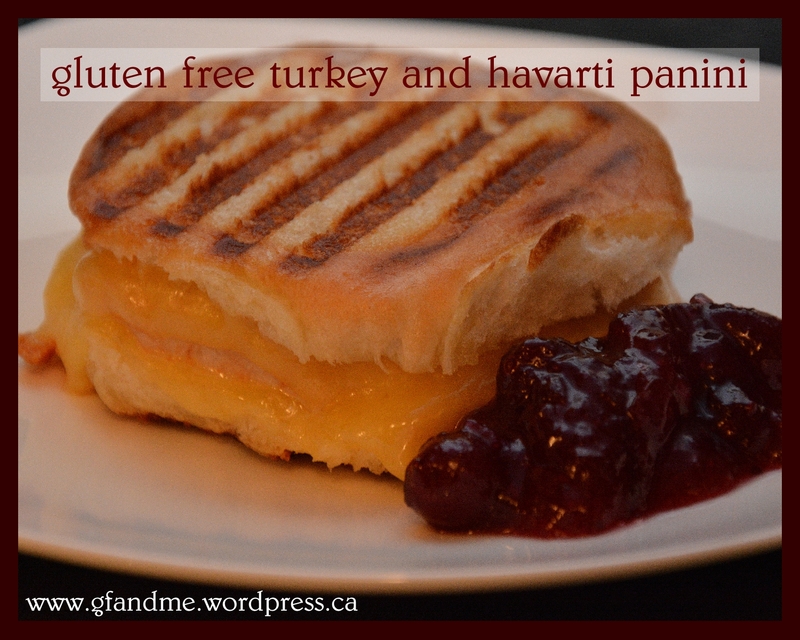 This entry was posted in Lunch and Dinner, Recipes and tagged celiac, GF, gluten free in Red Deer, griddler recipes, kinnikinnick, panini, sandwich. Bookmark the permalink. It’s really easy and great on those nights when you’re in a rush.